Vital Choice albacore tuna is the base product for Total Tuna! salad. Based on my research, no other canned tuna product comes close to delivering the level of quality I've come to appreciate from this special brand. According to Founder & Veteran Fisherman, Randy Hartnell, these are the top 5 reasons you should choose Vital Choice®. Although these reasons are 100% on point, to me Vital Choice® represents something much more personal. This special brand allows me the opportunity to enjoy the BEST albacore tuna on the planet with no worries about what it might be inadvertently doing to my health. Coupled with its Omega-3 Organic Salmon Oil Supplements (which deserves its own website as well, but we'll leave that for another day), Vital Choice® has made a HUGELY positive impact on my life and health. Now it's time to take the gift of these fantastic products and bring them to you all in the form of Total Tuna! But don't let it begin and end with me and my website. After all, many people who stumble upon Total Tuna! may not have access to NYC and the outlets where we're initially available. Worry not tuna lovers...Vital Choice® can be shipped directly to you! All you have to do to enjoy the incredible organic wild Alaskan albacore (and something even more premium called ventresca) tuna is CLICK HERE and place your order using PROMO CODE "2212". If you'd prefer, click any of the images next the the descriptions below to go directly to the page that corresponds to it. – called Ventresca in Italy – has been prized as the most succulent part. 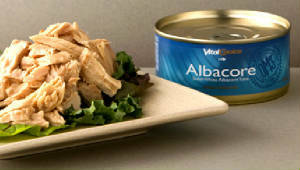 What is the difference between supermarket and Vital Choice custom canned troll-caught Albacore? We purchase young, troll-caught Albacore from small-boat troll fishermen familiar to us, and we know exactly how and where the fish are caught and processed. Mercury accumulates in tuna as they get bigger and older, so we select only the smallest troll-caught fish to ensure optimal purity. Not only does hook-and-line troll harvest attract the "cleaner" surface-dwelling juvenile fish, but it is also more sustainable than alternative methods. In contrast, the Tuna sold by supermarket brands is generally "long-lined." This harvest method involves deploying a long submerged line with baited hooks, which tend to attract the larger, older fish having higher mercury levels. Long-lining is also less selective than trolling and results in greater by-catch of non targeted species. Most canned Albacore found in supermarkets comes from very large canneries using assembly-line techniques to process huge quantities. Albacore Tuna sold by the major brands generally comes from larger, leaner Albacore that has been cooked twice – once before canning to facilitate skinning and de-boning – and again after the fish is in the can. Because of the initial cooking, many natural juices, flavors, and healthful omega-3s are lost. The pre-cooked meat is then placed in cans with water, broth (which may contain "hidden" MSG or free glutamates), or vegetable oils before being cooked for the second time. Younger, smaller, troll-caught Albacore like ours have more fat, but it is easier for big companies to work with the larger, leaner, long-line-caught Albacore in the assembly line environment. Starting out with leaner, older fish means that supermarket brands are deficient in flavor and omega-3s, compared with Vital Choice Albacore. How much mercury is in your Albacore compared to other tuna? Because we purchase only the smallest-of-the-small sustainably harvested albacore, it typically contains less than one-third the mercury found in commercially available alternatives. In addition to being the purest fish, young albacore also have the highest levels of omega-3s. This is in contrast to the larger long-line caught albacore, which are highest in contaminants and lowest in healthy fats. Furthermore, the larger fish are extensively processed (twice-cooked) in a manner that further diminishes the omega-3 levels in the product you buy. What is the time and temperature at which the tuna is cooked? The 6 oz. tuna is packed raw to preserve all of it's natural oils and nutrients, and then cooked for 66 minutes at 250 deg. F.
What kind of olive oil and salt do you add to your albacore tuna? To each can we add a small amount of "Real Salt" brand sea salt from Redmonds Minerals. Our extra virgin olive oil is from Spectrum Organics. What is used to line your Tuna cans? Like most food cans, our Tuna cans are lined with polyethylene terephthalate or PET, which is an extremely common, clearly safe food packaging material. NOTE: Our Tuna cans contain NO bisphenol-A (BPA), which is a chemical is used to make plastic more flexible. BPA produces effects in animals that raise some possible health concerns, but has been repeatedly found safe by U.S. and European authorities. PET has been studied extensively and deemed safe by many regulatory agencies. Like any indirect food additive, the scientific testing of PET is based on two key principles: establishing that there is a minimal amount of transfer of substances between the plastic packaging and the food, and establishing that any substances that may transfer from the plastic to the food do not pose a risk to human health. Today, even the most miniscule level of migration of plastic packaging into foods can be measured. These tests have found that the migration of any components of PET plastics under laboratory conditions is well below applicable safety levels. Therefore, FDA has determined that PET is acceptable to use in the applications for which it has been tested. The International Life Sciences Institute (ILSI) –a nonprofit organization dedicated to advancing the scientific understanding of issues related to nutrition, food safety, toxicology, risk assessment and the environment – has comprehensively reviewed the safety of PET in food packaging. "PET itself is biologically inert if ingested, is dermally safe during handling and is not a hazard if inhaled." "No evidence of toxicity has been detected in feeding studies using animals. Negative results from Ames tests and studies into unscheduled DNA synthesis indicate that PET is not genotoxic. Similar studies conducted with monomers and typical PET intermediates also indicate that these materials are essentially nontoxic and pose no threats to human health ..."
Haighton LA, Hlywka JJ, Doull J, Kroes R, Lynch BS, Munro IC. An Evaluation of the Possible Carcinogenicity of Bisphenol A to Humans. Regulatory Toxicology and Pharmacology (2002) 35: 238-254.